Mark Beaulieu strongly believes in giving people a second chance. He is privileged to be someone who can offer these chances at redemption through his business Flashpoint Laser Clinic Inc.
Flashpoint specializes in medical laser tattoo removal, giving people a fresh start, whether it's removing that old tattoo that's on a face or someone's hands. Marks says that “At some point it may affect confidence for jobs or just being in the public eye. Whether its removal or renewal, Flashpoint laser clinic will be there to see it through.” Mark seeks to make his services as affordable as possible so that average people can afford them. 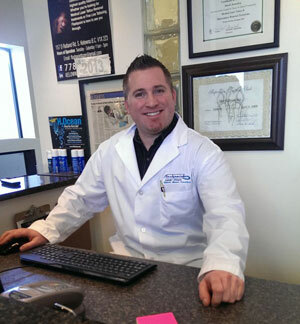 Today Mark and Flashpoint Laser Clinic are In Focus. For the better part of five decades, people with chronic health problems or severe allergies have worn MedicAlert bracelets to alert emergency staff to their conditions. But now there's a new trend, with some people turning to medical tattoos. Emma Bortolon Vettor, 19, is one of those who has a tattoo to tell the world she has a medical condition. The tattoo names her condition (called chronic adrenal hyperplasia) and the medication she needs in case of an emergency. Vettor says that after years of going through plenty of MedicAlert bracelets and chains, she decided a tattoo on her arm would be the best way to ensure she's always properly identified. "I find I lose my bracelet, and they tend to break. So why not have a tattoo?" she says. She says the tattoo cost her about $150, while her MedicAlert registration carries a $39 annual fee. But Vettor also remains registered with MedicAlert and has her registration number included in the tattoo, just in case. Charles Brisbois also replaced his metal bracelet with tattoo ink. He's allergic to penicillin and can only receive Type "O" negative blood. He also doesn't like wearing jewellery and kept forgetting to put on his medic alert bracelet. So he decided to design his own tattoo. "Tattoos aren't for everyone but if you are into tattoos, it's a great idea," he says. "It never gets lost. It's always with you." Heather Myles is the tattoo artist in Guelph, Ont. who designed the tattoo Vettor received. They picked the left arm because it's the same arm that a MedicAlert bracelet is typically worn on. It's also located in an area where health workers would normally insert an IV line. And they say they made sure the lettering could be easily read. "As long as you keep the font large and clear, it should hold up for a long time," says Myles. But some are not comfortable with the new trend. Robert Ridge of the Canadian MedicAlert Foundation notes that there are not guidelines on what information the tattoo should contain. Nor does a tattoo offer the other benefits of a MedicAlert registration, which includes a hotline that will give emergency staff detailed medical information. "It may not work as intended to and it may not provide link back to the medical files, with MedicAlert," he says. He thinks a medical tattoo could work as a complement to his company's service. "But it's not nearly as well known as the usual bracelet or necklace. An emergency responder may miss it in an emergency," he says. Some emergency workers say they don't care for the medical tattoo trend either, agreeing that they're not trained to scan a patient's tattoos, looking for medical information. But Brisbois says he doesn't regret his tattoo. He says his penicillin allergy is not something that will ever change throughout his lifetime and he says his tattoo is large enough that he doesn't think anyone would miss it. Emma says while she still wears her medic alert bracelet when she travels – "You can never be too cautious," she says -- she knows that her tattoo is an alert she will never lose.